Now one thing I really hate is getting up early. Most times you won't see me out of bed much before 8 a.m. and that's on my early days. In Neive though I'm up and about by 6 a.m. - I get up, leave my wife Maria still fast asleep, and wander the village lanes; returning to the Villa Lauri (where we always stay) at around 9 a.m. for breakfast. Am I mad? No doubt the thought crossed your mind and Maria might likely say that I am! Well I may well be but getting up early in Neive, on a spring morning, is a wonderful idea. You walk through cobbled lanes lined with picturesque cottages and every now and again you'll catch a spectacular view of the verdant rolling hills, the vineyards cascading down them. The air still has a slight chill about it, while a soft mist lends a magical atmosphere. Nobody is about and there is silence with only the occasional scurry or yowl of a cat to be heard. You begin to wander what century you're in (Maria reckons this confirms my madness), really though it is easy to do as everything here is exactly as it must have been 200 years ago. Once I've spent my two hours in the 18th century I return for a wonderful breakfast feeling like a new person, filled with a joy for life that lasts for days. This alone is reason enough to make me return time and again to Neive. If Neive can do that for you, all before breakfast, can you imagine what a couple of days here can do for the soul! The joy of being in Neive is experiencing one of Italy's loveliest villages and being part of life here, even if only for a few days. I mentioned the early mornings but the whole day is wonderful. After breakfast you have all the old folk heading to the markets with their shopping carts in tow, ready to load up on groceries and the latest gossip in the piazzas. It goes on like this all through the day with changing characters taking the lead in an unbelievably beautiful setting. There's a lot of history here too with a number of 13th century to 16th century villas (Casa dei Cotti is the most famous). Don't miss the charming little chapels of San Rocco and San Sebastiano and the 13th century Clock Tower (Torre dell'Orologio) either. Of course if you enjoy wine you have endless great wineries on your doorstep, the Cascina Saria (read article) is my pick of them. Being Piedmont, anywhere you eat is going to be good and traditional. One of the restaurants I can really recommend though is the Aromatario. 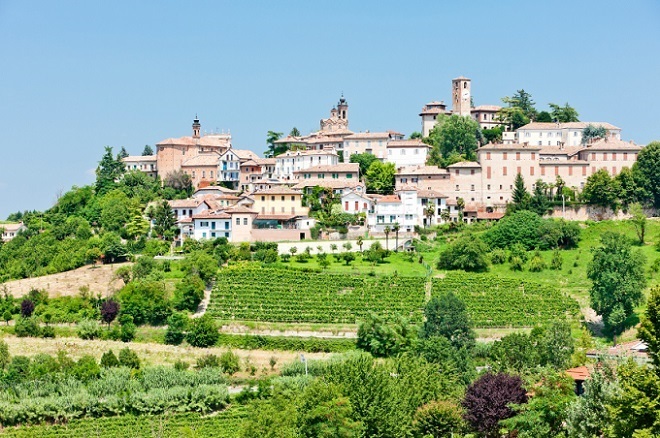 Try their tasting menu which allows you to sample a selection of local dishes accompanied by excellent Piedmont wine. Not much doubt about it – the Villa Lauri. I wouldn't stay anywhere else. However I have received a number of messages from people who've stayed at the L'Aromatario (photo on page) simply raving about the place so maybe have a look at them too. If their accommodation is as good as their food you'll be alright. Like us? Why not support me and Maria. All you need do is book via the search box below, or any of the hotel links elsewhere on the website. It can be for travel to Italy... or anywhere else on earth. Never have to accept money from hotels directly - meaning that we can share only those we genuinely love. Montemerano - Oh I love you! Balconies, flower boxes, the inevitable washing on lines, wall plants, pots; and intricate stone. Another garden village I wish I lived in. One does get wistful in Montemerano. Panna Cotta - A Decadent Piedmont and Italian Dessert that will leave you absolutely begging for more. Served with fresh berries this truly is the taste of an Italian summer..
Italy Has a Coral Reef!